The Volcano de Colima, also known as Volcán de Fuego is one of the most active volcanoes in Mexico and well known for the unusual and mysterious activities surrounding this mountain from bright lights streaking across the sky to unidentified flying objects in different shapes hovering near the volcano. According to the myths, all the strange activities are linked to aliens and the God Quetzalcoatl who, often depicted as a feather serpent represents the ascension of human consciousness back to its origins, promised to return one day. 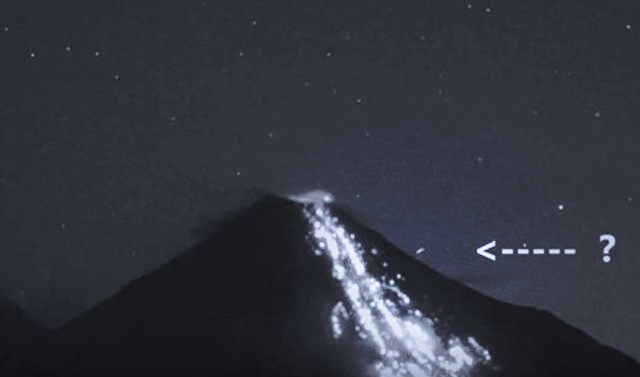 The latest strange activity caught on the live stream cam on October 9, 2016 shows a cigar-shaped UFO leaving the Colima volcano.